I made the mistake of leaving Facebook open on my desktop as I stepped out for the evening on Tuesday night. I returned to a complete mess of Facebook Chat messages. 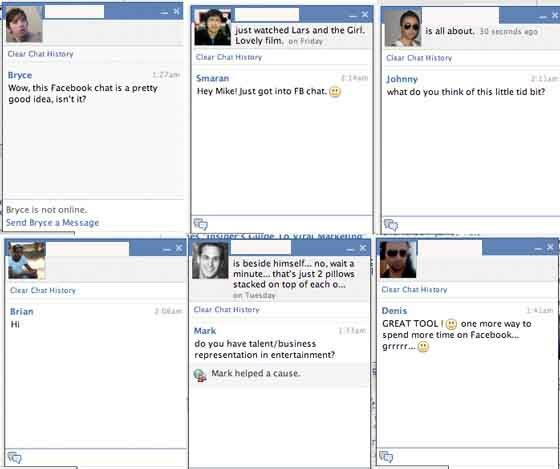 Some users got access to Facebook Chat as early as April 6. Others trickled in over the following two weeks. But in the last hour a mass of users (all the rest, as far as I can tell) is reporting seeing it for the first time. I have a policy of accepting all friend requests on Facebook (although I am quickly reaching the 5,000 friend limit). Apparently a significant number of my friends decided to test Facebook Chat as it went live with yours truly. I’m trying to respond to the messages, but a response seems to lead inevitably to a conversation, and having 25 of those at once is a little challenging. Meanwhile, eight more pop in. Settle down, Facebook friends, and don’t be offended if I’m not jumping right in to the conversation. Except the guy who said his dad is an investment banker for Yahoo – please keep sending those messages.